In July 2010, Unitarian Universalist Annette Marquis made the hard decision to participate in the National Day of Non-compliance in Phoenix, Arizona. She went there to protest the passage of SB 1070, planning to be arrested, and spent a long night in the notorious jail run by Sheriff Joe Arpaio. Marquis reflects on what compelled her to action and what she learned about the struggles of migrants and people of color in Maricopa County and about being an ally in the fight for justice. July 29, 2010, 10:22 a.m. Even in the early morning hours, the Arizona sun had scorched us as we marched from Trinity Episcopal Cathedral to Cesar Chavez Plaza in Phoenix. I now stand with hundreds of other protestors, baking in that sun, at the intersection of Washington Street and First Avenue in downtown Phoenix. I’m sure it has to be at least 120 degrees out here. Sweat trickles down my chest and back and pools at the waistband of my pants. Fortunately, I had stopped at a sporting goods store last night and bought a lightweight white golf cap. ClimaCool, it is called. I can’t say it is keeping me cool, but at least sweat isn’t dripping down my face as well. In addition to my protective hat, I am a wearing a bright, goldenrod-colored T-shirt with the logo and motto of the Standing on the Side of Love (SSL) campaign, a public witness program of my faith community, the Unitarian Universalist Association. My arms are linked firmly at the elbow with two other protestors, so if the hat doesn’t do its job, there is no way I can wipe the sweat from my face. Today is the day Arizona enacts its latest anti-immigration legislation, SB 1070, commonly referred to as the “Papers, Please” law. This law requires everyone, American citizen or not, to carry identification papers or risk being arrested as an illegal alien. As a middle-class, white woman of Irish, French, and German descent, I know police will never stop me and ask me for my papers. They target only people of darker skin, people who do not speak English as a primary language, people who, according to the police, “look” illegal. Systematically targeting and arresting people because they fit a profile of an illegal immigrant violates the first of the seven Principles of Unitarian Universalism, which affirms “the inherent worthy and dignity of every person.” This egregious violation of human rights prompted me to decide, along with scores of other Unitarian Universalists, to engage in nonviolent civil disobedience and put myself in the position of being arrested. I also chose, as is my right as an American citizen, not to carry my identification with me. 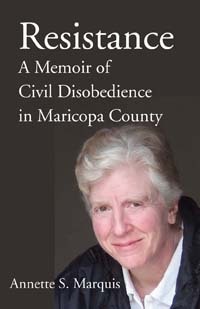 Resistance offers an accurate portrayal, from the perspective of a white ally, of the massive protests in Phoenix, Arizona, against SB 1070 in July 2012. This account brings the spirit of love and solidarity, as well as the heat and tension of that day, vividly home. It also captures the Maricopa County Sheriff’s department’s brutality, experienced by all who have been held in that jail. Marquis's journey through doubt, determination, fear, and back to determination echoes the experiences of many that day, including my own. And she rightly sets it in the context of the larger struggle waged across generations by people on the margins, particularly women and people of color--a struggle to resist indignity and inhumanity, a struggle for justice and human rights.